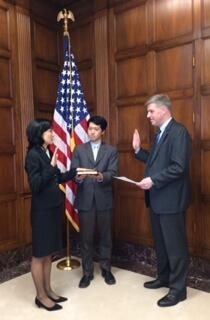 Yesterday, I had the honor of swearing in the U.S. Patent and Trademark Office's (USPTO) new deputy director, Michelle Lee. Lee most recently served as the first director of the USPTO’s satellite office in the Silicon Valley, which has one of the nation’s highest concentrations of startups and companies in the high tech industry. While serving as director, Lee and her team actively engaged in patent and trademark education and outreach efforts to the vibrant entrepreneur community in Silicon Valley. Beyond the Silicon Valley office, Lee has played a broader role in helping shape key policy matters impacting the nation’s intellectual property system, focusing closely on efforts to continually strengthen patent quality, as well as curbing abusive patent litigation. Prior to becoming Director of the Silicon Valley USPTO, Lee served two terms on the USPTO’s Patent Public Advisory Committee, whose members are appointed by the U.S. Commerce Secretary and serve to advise the USPTO on its policies, goals, performance, budget and user fees. The USPTO has four satellite offices nationwide, which enable the agency to provide more resources to more area entrepreneurs, tailor programs to local startups and industries, and more effectively create good-paying, high-skilled jobs. The satellite offices are just one part of the USPTO’s work to protect the cutting-edge ideas that keep America globally competitive, help entrepreneurs get their products to market more quickly, and help empower innovators with more resources to protect and scale their products. The agency’s work also puts them in the critical role of supporting the growth of regional innovation ecosystems. Innovation is the key driver for U.S. competitiveness. The concept of taking knowledge and turning it into business lies at the heart of our nation’s wage and job growth and our economic vitality. In fact, as much as half of the economic growth in the U.S. can be attributed to knowledge advances. That is why promoting and strengthening innovation is one of the three pillars in the Commerce Department’s “Open for Business Agenda.” Our innovation agenda focuses on three main components: manufacturing, skills and the digital economy. America’s manufacturing strength is a key indicator of our innovative capacity, and we are committed to supporting manufacturing at every stage of the product life cycle. For the first time, we are also focusing on working with industry to create a more talented and skilled workforce, which is an essential component of a modern, innovative economy. Finally, the digital economy is a powerful engine of innovation and economic growth in the 21st century, and Commerce plays a crucial role in defending its importance. We plan to unveil a plan in the coming months that aims to nurture the innovative potential of the digital economy, and champion the entrepreneurs and small businesses at its core. I look forward to working with Michelle Lee and her USPTO colleagues to strengthen America’s innovation economy in the months and years ahead. Submitted on January 18, 2014 - 11:05am. Many of the most creative and innovative companies started in a carport, Garage, or around a table at a pub. Today it is next to impossible to do that. The solutions are here, however, it requires the government to become better, smaller and deliver a creative product. The radical left and the regressive right form the tails of the two dogs in the hunt. Allow that one of the many other parties will emerge to fill the gap to the center left. What is needed is a political unit that fills the historic based American Reasoned Center to Right or the Conservative sector of voters … who defend the constitution, want to restore it to be the original back drop of the Republic and work to end the play for campaign cash and the buying of Voters that entails and to focus on the health of the Republic, its States and its Citizens. And do this for God and Country and the Founders !